Sha Na Na’s claim to fame began as they played the original Woodstock in 1969. Not only were they the only band at Woodstock without a record deal, they had the honor of going on second to last just before legendary guitarist Jimi Hendrix on the final day. From there the band even managed to have a TV show that lasted from 1977 through 1981. Today the band still plays shows and helps keep the music of the fifties alive. The crowd inside the Bears Den for a Saturday afternoon matinee, were treated to a show that had a little something for everyone. The band still features founding members John “Jocko” Marcellino and Donny York. Pianist “Screamin” Scott Simon is the only other member left from the television show era. Rounding out the current roster are guitarist Gene Jaramillo, “Downtown” Michael Brown on sax, drummer Paulie Kimbarow and bassist Tim Butler. The band started off with “At The Hop” and did a great job mixing in several songs from the past. Of the ones that stood out were the classic “California Sun”, sung by guitarist Jaramillo, “Come Go With Me” and the band’s standard closing song “Goodnight Sweetheart Goodnight”. Jaramillo also tackled “Sandy” a track written by Simon from the Grease soundtrack. As Jocko stated “Grease” is still the word. An interesting “Itsy Bitsy Teenie Weenie Polka Dot Bikini” showed the band’s comical side as Jocko and York each held one end of a towel that was concealing Simon. Once the towel fell it showed Simon in a wig, dressed in drag wearing a two piece bathing suit. All in all the show was a great tribute to several songs from years past. Sha Na Na does a fantastic job helping to keep the past era’s sounds and memories alive. It appears they have built a solid foundation in preserving the past and exposing it to generations old and new alike. 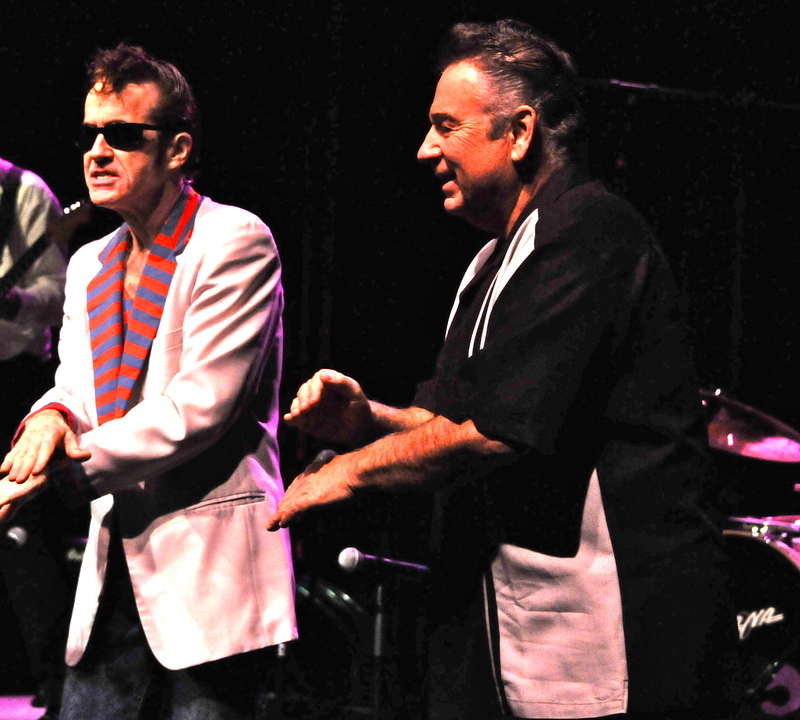 This entry was posted in Concert Reviews, Photo Gallery and tagged 50s, Sha Na Na. Bookmark the permalink.